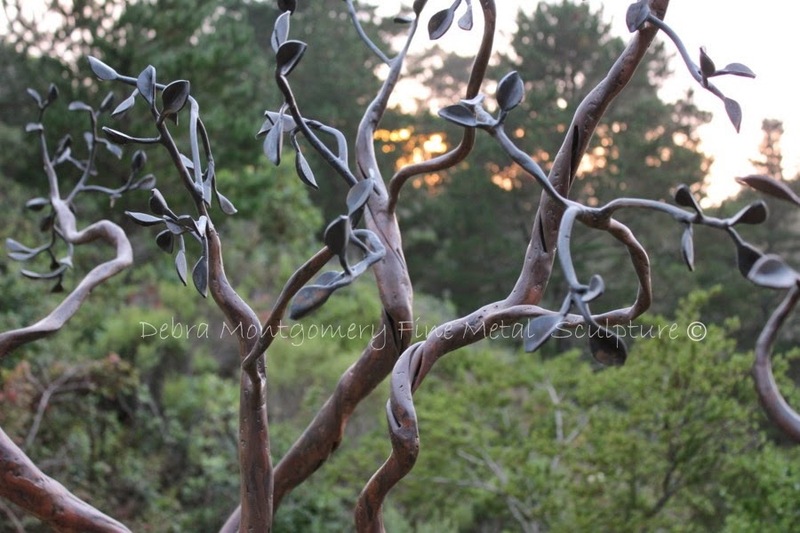 DEBRA MONTGOMERY - FINE METAL SCULPTURE: The Internet Is Becoming The New Yellow Pages - Are You Ready? The Internet Is Becoming The New Yellow Pages - Are You Ready? I don’t claim to be an expert in internet marketing or website building, but I can share with you what I have learned by trial and error in relation to our business exposure on the world wide web. In this economy, I think small businesses need as much of an edge as the possibly can get without spending a fortune. It appears that the internet is becoming the new yellow pages. Having a website or blog is a great way to get your name, portfolio and content out there in connection with your particular market locally, as well as get some nationwide and world wide exposure for what can be minimal cost compared to most conventional advertising. “Do It Yourself “ web site building services. Everyone is tightening their belts these days and building your own website is one way to save some up front expenses. I have experimented with “do it yourself” website building services since we opened our business 7 years ago. I will talk about four which in my opinion, are the most user-friendly, most reasonably priced for what you get, have nicer templates and have decent integration/site verification with Google, Yahoo and Bing website tools. Site verification gives you the tools to get information about your site, helping you improve your site optimization by tracking how your site is working on the web. The first service, which is my favorite and is the service we are currently using for both our sites, is Bandzoogle.com. This is a website service that was created initially for the music industry with many easy to use features for the more artistic venue. While it was created for the music industry, I think it crosses over very well with many useful features for visual arts as well. The templates are attractive and artsy. The site building tools are extremely easy to use so even the most novice website builder can put together a very nice site. For the more experienced website builder, you can utilize the more advanced features on the templates or you have the capability to build a completely custom site. The prices are reasonable starting at $9.95 for a 10 page/1 email site up to $19.95 per month for unlimited pages/10 email site. They can also host your domain. This service has seamless integration/site verification with Google Webmaster Tools. With regard to technical support, you have live chat and email “help desk” correspondence available and they are quick to respond. The only thing I don’t like about this site is, at this time, there is no way to promote each individual page. Having said that though, I have not noticed a drop in the visitation to our site since switching. Go to Bandzoogle.com for more information and a free, no-obligation 30-day trial. Honestly, out of all of the do it yourself services I have tried, this is the easiest I have used to date, as well as the smoothest transition when moving from another service. The second, GoDaddy.com, is a decent do it yourself service with very reasonable prices. You can get a domain name for as low as $1.99 and a 5-page website for as low as $4.99/month. The templates are relatively easy to use and they have a good choice of some very nice professional looking templates. There is seamless integration/site verification with Google Website Tools. For the advanced user, you can squeeze a little more out of the templates using some of their advanced features. Techical support is not bad. GoDaddy.com hosts the domain names for websites through their service, and can host your domain if you are not using their website building service. You get a professional email box option with GoDaddy.com also. Go to GoDaddy.com for more information or to start a website. The third, Wordpress.com, is a little more complicated. In my experience, it requires a little working knowledge on putting a site together here, but it is not too difficult. One thing about Wordpress.com is that there is seamless integration/site verification with Google Webmaster Tools, Yahoo Site Explore AND Bing Web Tools. It takes sometimes 24 hours to get an answer from the help desk. You can use Wordpress.com for free as a blog OR, you can pay $25.00 for the year for a domain name, that they host, and have an actual “yourbusinessname.com” website address. F.Y.I: Don’t get this service confused with Wordpress.org which is for website builders with very advanced skills - Wordpress.com is designed for doing it yourself. The fourth, Blogger.com, which is a blogging “service” through Google. This is another situation where you can obtain website presence for free. However, if you want to have an actual “nameofyourbusiness.com” website address, you have the option here, like Wordpress.com, to upgrade to a domain name. Blogger.com domain names are hosted by GoDaddy.com and for as little as $10.00 a year, you have a .com address. No professional email services are offered through Blogger.com. However, you can use whatever active email address you have through this service. Help forums, etc., are available for technical questions. Since this is a Google “product,” the integration/verification process through Google Website Tools is automatic.